Many app developers use Facebook to run app install advertising campaigns. And when working at scale, they often rely on one or more of Facebook Marketing Partner (FMPs) -- companies that provide tools to greatly improve the process of creating, testing and running ads. Today, we’re announcing a partnership with a FMP that we truly love. Bidalgo, our first FMP partner, is highly recommended to all Tenjin users. Bidalgo’s proprietary algorithms (“bid algos” -- get it?) and tools include A/B testing, data aggregation, and real-time bidding. Users can choose either a sleek self-serve interface, or a fully managed service that includes creatives. In combining Bidalgo and Tenjin, you’ll see significant improvements throughout the entire marketing toolchain. While Facebook as a marketing platform can be extremely effective, getting the most out of it typically requires app developers to rely on a multitude of ad formats -- and tracking and management can quickly become chaotic. 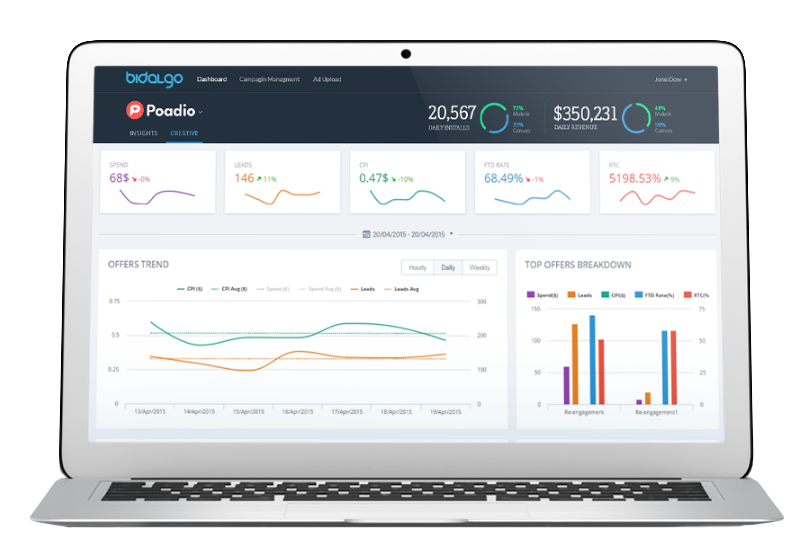 This partnership enables marketers to track Bidalgo alongside any other channel, resulting in fully optimized lifetime value (LTV) and return on investment (ROI). Monitoring LTV, ROI and other key performance metrics for multi-channel advertising gets easier every day with Tenjin’s dashboard. For more on how to get started, get in touch at support@tenjin.io.